This year’s presidential nominating season has upended conventional political wisdom in any number of ways – from the dominance of Donald Trump on the GOP side to the surprisingly tough battle between Hillary Clinton and Bernie Sanders on the Democratic side. The keenly contested races also are driving record turnout among Republicans and higher than usual turnout among Democrats. Turnout in presidential primaries varies considerably among states, and typically is lower in years when an incumbent faces no serious challenge for renomination. But looking at overall turnout rates since 1980, certain trends were clear: Combined major-party turnout fell from 25.7% in 1980 to 14.7% in 2004, before rebounding in 2008. 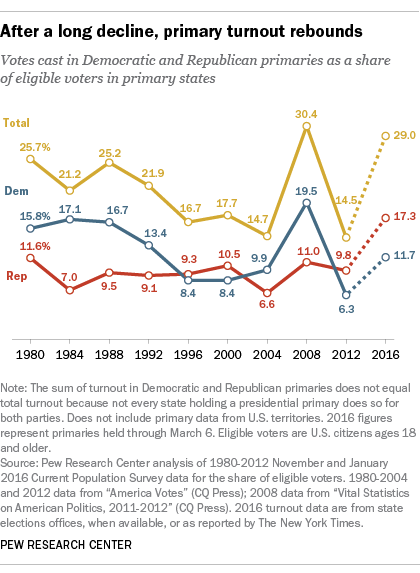 Much of that was due to declining turnout in Democratic primaries; GOP turnout, by contrast, was relatively stable from 1980 through 2012, averaging about 10% in years with contested nominations and dipping to 7% or lower in uncontested years. But even in relatively high-turnout years such as 2008 – and, so far, 2016 – primaries attract far fewer voters than general elections, even though (barring a contested convention) they determine whom voters get to choose from come November. In 2012, for instance, 129.1 million Americans, or 53.6% of the estimated voting-age population, cast ballots in the presidential election, versus fewer than 28 million in that year’s primaries. In 2008, 131.4 million people (56.9% of the estimated voting-age population) voted for president in the general election, more than twice the “record” number of primary voters that year. For this analysis, we calculated primary turnout as the number of votes reported cast in state party primaries divided by the estimated number of voting-age citizens (derived from our analysis of Current Population Survey data) for all of the primary-holding states. We began with 1980, because primaries didn’t become a significant part of the nominating process until after 1968, and available turnout data for 1972 and population data for 1976 were incomplete. A few caveats: Because states don’t always hold both Democratic and Republican primaries, the total turnout rates for the two parties individually may not equal overall turnout. We didn’t calculate turnout for Puerto Rico and other territories, because the CPS doesn’t include them. Nor did we try to measure turnout in caucus states, because caucus attendance isn’t always reliably recorded and reported. We did, however, include both binding and nonbinding (or “advisory”) primaries. In general, far more people say they’ll vote in primaries than actually do (as late-night host Jimmy Kimmel recently demonstrated). In a Pew Research Center survey from September 2015, for instance, nearly two-thirds (63%) of respondents said it was “very likely” they would vote in either the Republican or Democratic primary or caucus in their state. So far this year, however, the highest turnout in any state primary has been in New Hampshire: 52.8% of that state’s estimated voting-age citizens cast ballots in either the Democratic (24.7%) or Republican (28.1%) primary. New Hampshire, which fiercely protects its status as the nation’s first primary, has led the nation in overall (Republican plus Democratic) primary turnout in all but one election year since 1992 (Montana edged it out by seven-hundredths of a percentage point in 2004). The 2008 Democratic race, in which Clinton and Barack Obama were closely matched and battled to the very last primaries and caucuses, stands out as an anomaly, with overall turnout of nearly 20% – the highest level among either party in any election year since 1980. This year’s GOP race, though, appears to be at least challenging that mark: Of the dozen Republican primaries so far this year, 10 have set turnout records. Still, it’s worth keeping in mind that because turnout rates in primaries are relatively low, candidates can win their party’s nomination with relatively few votes. In 2012, for example, nearly 18.8 million people voted in 39 Republican primaries, or 9.8% of the eligible voters in those states. Mitt Romney won 30 states (plus D.C.) with just over 9.8 million votes – representing just 5.1% of the eligible voters in the primary states.